A big pot of soup simmering on the stove is a welcome sight, especially as the seasons change and the nights begin to turn chilly. 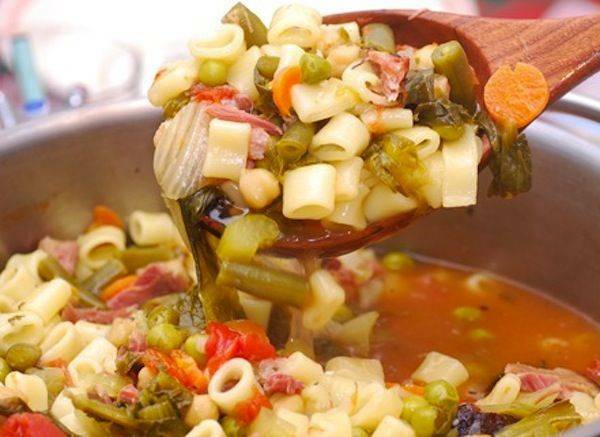 This minestrone, which is perfect for a first course or main dish, is from my new book, The Italian Vegetable Cookbook. 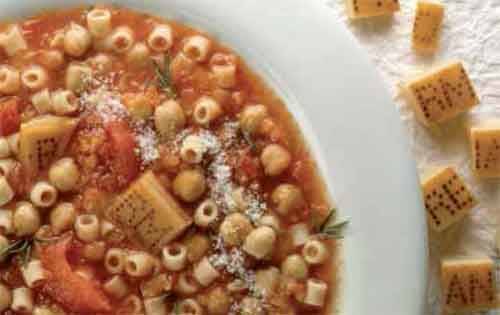 Though there are many versions of minestrone, I liked the fact that this one contains sage and fennel, which gives it a lot of flavor. Serve it hot or at room temperature with a drizzle of extra virgin olive oil or freshly grated Parmigiano Reggiano. In a large pot, cook the onion, carrot, celery, fennel, garlic and sage in the olive oil, stirring occasionally, until the vegetables are tender and golden, about 10 minutes. Stir in the tomato paste and cook 2 minutes more. Add the chickpeas, broth and water. Bring to a simmer and cook 1 hour, or until the vegetables are very tender. Mash some of the chickpeas with the back of a spoon to thicken the soup. When the soup is almost ready, add the pasta and stir well. Cook, stirring occasionally, until the pasta is tender. If the soup is too thick, stir in a little warm water. Taste for seasoning. Serve hot with freshly grated cheese.